Four-wheel alignments help ensure your tires are angled and oriented properly. This means they’re correctly level with the ground, pointing straight ahead, and parallel to each other, enabling your car to drive, or “track”, in a straight line as well as turning properly. Not only does this make it easier for you to drive your car, it also helps minimize uneven tread wear and maximize the life of your tires. In extreme cases, poor alignment can even harm your fuel economy, possibly costing you noticeable extra money at the gas pump. Action Gator Tire proudly offers the very best in four-wheel alignment services. We have 29 locations throughout Central and South Florida, so proper alignment is never far away. 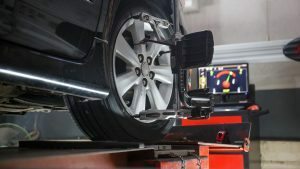 Our teams of ASE-certified mechanics use years of experience and cutting-edge computerized equipment to dial-in just the right levels of toe, caster, and camber to ensure your car drives just right. We’ll make your drives easier and more relaxing while saving you money in tires and gas in the long run. All you have to do is find your nearest Action Gator location, and make an appointment today! Proper wheel alignment ensures all four wheels are rolling straight ahead together while providing the right amount of grip. That means if one or more of your wheels is out of alignment, it could cause your car to “pull” to the right or left rather than tracking straight and true. This could make it difficult or tedious to cruise at high speeds, especially on longer trips. All it takes is hitting a curb or pothole too hard, and your car could be out of alignment. With regular professional four-wheel alignments from Action Gator, you’ll be sure you’re getting an easy, relaxing driving experience with maximum fuel economy and minimal excess tire wear. There are three key aspects to wheel alignment, each representing a specific angle. Every car on the road needs just the right balance of toe, caster, and camber for proper performance, tire wear, and fuel efficiency. Learn more about toe, caster, and camber below. Toe is basically a measurement of how parallel your tires are to each other when viewed from directly above. Every vehicle has a proper toe angle both for the front tires and for the rear tires. A positive toe angle, also known as “toe out” means the fronts of the two tires are farther apart than the rears. Conversely, a negative toe angle, or “toe in”, means the fronts of the tires are closer together than the rears. 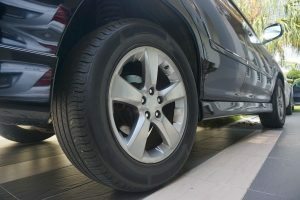 Most cars on the road call for very small toe angles that simply compensate for some minor suspension movement as the car is driving, ensuring tires run parallel at speed and don’t drag along the pavement, causing excess wear. Caster is the steering pivot axis angle of the front wheels, generally measured against an imaginary vertical line running from the top to the bottom of your front tires. Having the right amount of caster angle, as designed by the vehicle manufacturer, will keep the car from wanting to turn on its own while cruising. It also factors into how much effort it takes to turn the wheel at speed as well as overall high-speed stability. Camber is the angle the tires lean when viewed directly from the front or rear. A positive camber angle means the tops of the tires are farther apart than the bottoms, while a negative camber angle means the opposite. Racing cars use extreme levels of negative camber to keep their tires upright and gripping optimally as they’re cornering at high speeds. Most road-going vehicles use very minimal camber, most often none at all for the front tires and usually about half a degree of negative camber for the rear tires. Too much negative camber might give you a bit more grip in fast turns, but it will also cause the insides of your tires to wear out faster than normal, so the right balance is key.